There has been a lot of action in the Bluetooth speakers market, with a recent drive towards improving performance and offering a better quality of device. There's been a veritable explosion at the top-end, with reputable audio companies embracing wireless music in a way they didn't previously. There's also been great diversity in portable mini speakers, which is where Pure's Voca lies. Priced at under £90, if you're looking for a portable speaker you can easily stuff into a bag for days out or holidays then the Voca gives you plenty of boom for your buck. The Voca is finished in a seamless brushed aluminium surround with a dark grey colouring, with the front and back filled with metal grilles. There's a quality feel to the build and an elegant simplicity to the design, which reflects the sort of thing we've seen from Pure in the past. Measuring 189 x 55 x 67mm, the Voca is compact, and that sturdy build means a weight of 580g due to the choice of materials. All the controls lie across the top - comprising power, call answer/hang-up, Bluetooth (for pairing), mute and volume up/down - each with a rubberised finished and a nice clickable action to them. You'll know for sure when you've pushed a button, which is preferable to the slightly non-descript touch controls you sometimes find on such products. Around the back of the Voca is the power connection and 3.5mm socket for an auxiliary input. It needn't be plugged in at all times, though, as there's a battery on board for on-the-go listening. On the base there's a rubber pad with feet to reduce vibration against the surface it's placed on and stop it moving around when those bassier tracks in. We like that it's not overly-showy by design. There's a simple "P" for Pure on the front, but otherwise it's free from clutter. 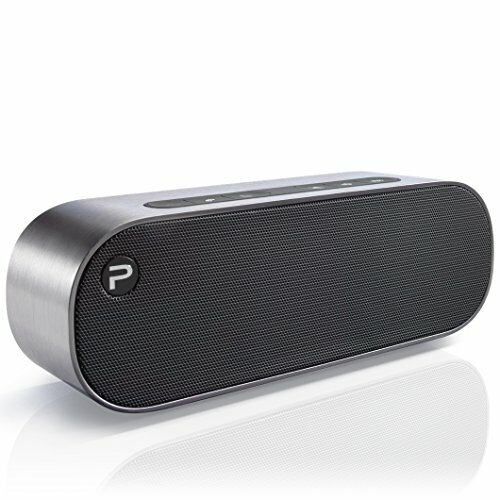 It might not have quite the same quality of finish as the Bose SoundLink Mini, but we love the Pure's rounded ends. The challenge for this size of device is to produce well-rounded results. It misses out on a couple of technologies however. There's no NFC for example, which would offer simpler pairing - and the wide adoption of that technology by Android and Windows Phones means that Pure should certainly add it to the list for the future. There's also no aptX support (for CD-quality audio), although arguably, pushing higher quality Bluetooth audio would potentially be lost given the small scale of this speaker. Still, if that's high on your checklist, you might want to look elsewhere. We found the quality of the connection to be good and when streaming from various smartphones, tablets and Mac laptops, we've had a solid connection without the Bluetooth dropping. The Pure Voca delivers 10W, which is just about what you need for a portable mini speaker. It will give you room-filling volume, ideal for taking on the move, or for the kitchen or bedroom. With a speaker of this size, positioning is important. It's better placed close to a wall or somewhere with something behind it to get the richest sound. As with many small speakers, it doesn't project the highs very widely, so the higher you can get it - and the better aligned with ear level - the better balanced the sound is for the listener. The Pure Voca delivers rich sound, with plenty of bass thanks to the two 1.5-inch speakers with dual passive radiators, so it avoids that tinny sound you can get from some small speakers. At times the leaning towards bass might be a little heavy: feed it a heavy bass track and while the rubber feet keep vibration to a minimum, on a cluttered surface you might find things shaking around a little. There can be some distortion at the extremes at higher volumes, but we found that the Voca was very capable at dealing with a wide range of music types, with a richness for classical tracks and plenty of pop for popular music. The Pure Voca is also fully equipped as a speakerphone, so if you want to use it for conference calling, you'll be well equipped. The internal battery in the Pure Voca will give you around 10 hours of listening. In our tests, this figure proves to be accurate. It's not a removable battery, though, so you'll have to plug it in to recharge - just like with many other portable Bluetooth speakers. If you're already invested in Pure Jongo multi-room technology then it's also worth pointing out the Voca is a standalone portable that isn't compatible with that setup. The Pure Voca is a lovely mini Bluetooth speaker. It's ideally suited for taking away on travels or holidays, where its portability and performance will be valuable, while at home it has the performance to bring you music to any room. However, there are some technologies missing: aptX and NFC are both absent and these would have seen the Voca hit some important spec-sheet points. The top volume notches are a little ambitious and best avoided too. Overall the Pure Voca offers a great quality design thanks to its brushed aluminium body, while audio is rich and bassy considering the compact body, all for a price that won't break the bank.